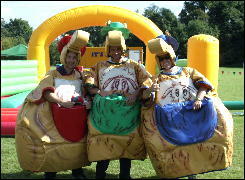 The games format of "It's A Knockout" is still around today in the UK. Many charities, town shows, galas and the like run their own version of the event. It is an ideal arena event that can be used to pay for itself by getting companies and groups to sponsor or pay for their involvement. 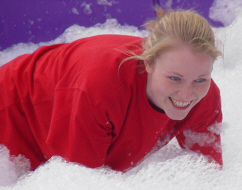 It is used for company fun days and team building events. 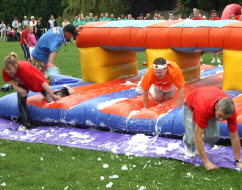 Different departments of a company get together as teams to "take on each other"
On their website you will see the various ways of running an "It's A Knockout" event including charity and fundraising ideas.